Several months ago, we weren't so sad to share the news that Qdoba was closed on the corner of 19th & Chestnut. We were, in fact, pleased to tell you that Pearl Properties was planning to build a large mixed-use project on this corner, combining multiple properties into a big one just a block off the Square. We did, however, lament the apparent fact that the two-story deco building on the corner that previously held the Qdoba would be a casualty of the project. 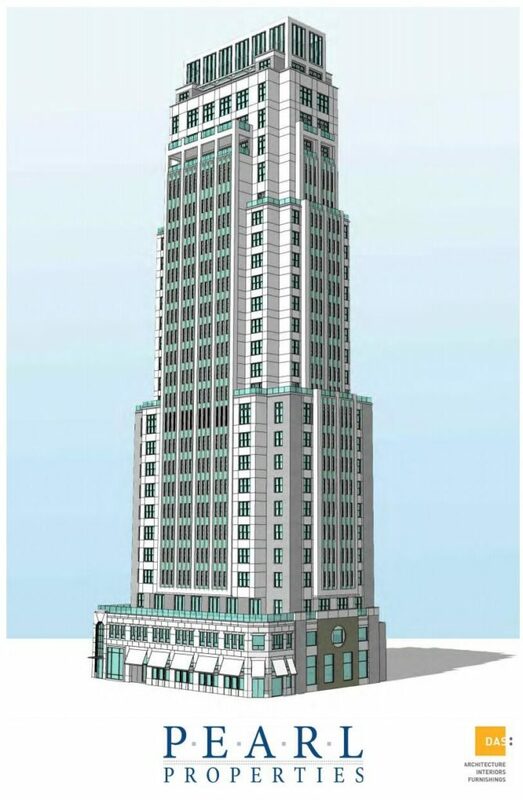 Today, we're happy to tell you that a rendering has surfaced online, from a poster on Philadelphia Speaks. The 25 or 26 story building is pretty good looking, and even maintains the corner property! Design work is from DAS Architects. According to Philly Chit Chat, the site that originally broke the story about this project, CCRA has already met with the developer a couple of times and they will be hosting a public meeting about the project on April 29th. It should be interesting to hear what the community has to say about a new tall building with heaps of apartments and no parking. If you ask us, it's a no brainer. We can't, to be honest, think of a site where this kind of density would be more appropriate. And with plans for the new iPic moving forward at the former site of the Boyd, this stretch of Chestnut Street promises to be dramatically activated in the coming years. That is, assuming that Pearl is able to get the necessary variances to build this building. First, we'll see what kind of input the neighborhood gives them.